My roast lemon chicken recipe is superior. It has a fresh lemon flavor and is perfectly seasoned. I also offer a grilled lemon chicken recipe that's delicious. Homemade lemon pepper makes a huge difference in the taste of the grilled chicken. Carefully remove the zest from the lemons using a zesting tool or vegetable peeler. The pith (white) part is very bitter and you don’t want that in your seasoning. Place the zest in a bowl. Place the pepper corns on a cutting board and crack them by pressing down on a clean bottom of a heavy pot or pan. You don’t want them ground, just cracked in large pieces. Put in the bowl with the lemon zest. Use a wooden spoon and mash the cracked peppercorns with the lemon zest. This releases the lemon oil so it combines with the cracked pepper better. 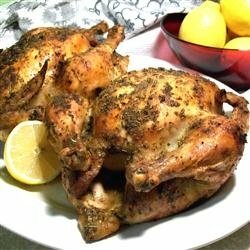 This roast lemon chicken recipe is excellent on the grill too. If you double this recipe, do NOT double the oil. PREHEAT oven to 450 degrees. Lightly spray a 9x13 pan with oil and pour the chicken broth in the pan. Mix the canola oil and lemon juice together. Add the Italian seasoning, garlic, and homemade lemon pepper together and rub under the skin, over the skin and inside the cavity. Place the spent lemons inside the cavity before roasting. Roast for approximately 20 minutes; lower temperature to 375 degrees and bake for 1-1/2 to 2 hours; basting the chicken with the leftover lemon mixture. Approximately 30 minutes before the chicken is done, remove the foil so the skin can crisp up. Pour the pan juices into a large glass measuring cup. Spoon the fat off the top. Add the chicken broth to the roasting pan and place over high heat. Bring to boil, scraping up any browned bits. Return the pan juices to the pan. Whisk the flour into the broth mixture and bring to a boil until slightly thickened, about 2 minutes. Season the sauce to taste with salt, and pepper. Serve the lemon herb gravy alongside the roast chicken. Fluffy and creamy mashed potatoes are a perfect accompaniment with the lemon chicken.